A combination of wanderlust, luck and professional opportunity made that fortune come true in 2010. 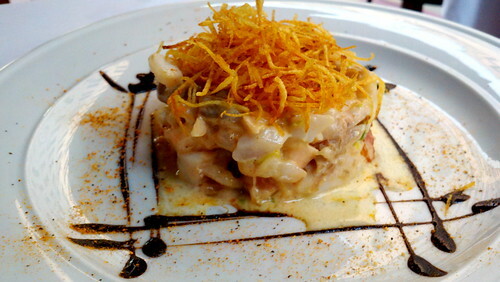 I sampled fresh fish and explored new flavors in Russia as a guest lecturer for St. Petersburg State University. 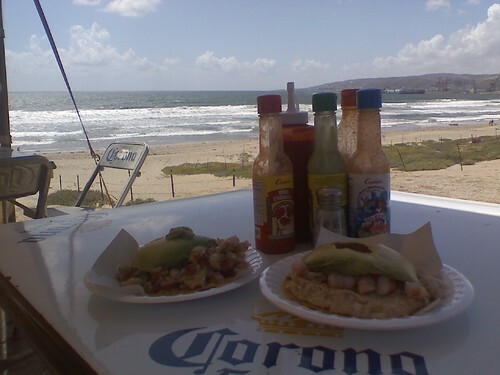 We celebrated my birthday with ceviche on the beach in Ensenada. Finally, I left my Sacramento newsroom behind and became the Newark Patch editor. In this Alameda County city, I cover news, politics, crime and other issues that matter to Newark residents. 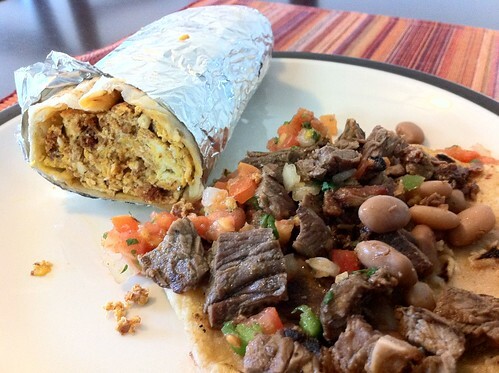 Plus, I have a chance to profile all the amazing food spots in Newark. You can find rest of my album, “In My Tummy: 2010,” on Flickr. What do you think? What should I try next? Download this episode now. Pair my small bite of seafood with a nice Riesling or a cool Belgium-style brew. I’m dreaming about cool flavors with a little sparkle. One night, we had dinner on the patio. My hubby grilled salmon and bacon-covered asparagus. He was inspired by our buddy Scott and his method for preparing a big serving of salmon the grill. This week – I was hungry for white rice and home cooking. 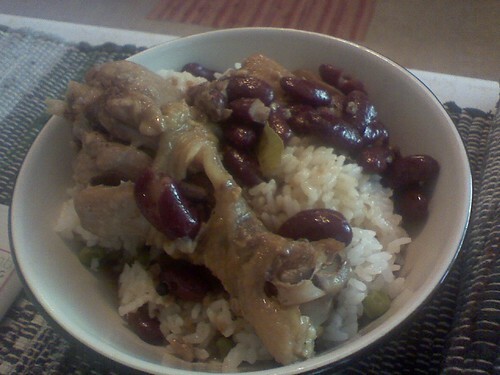 I made my family’s chicken adobo and added kidney beans. Trust me – it works! The kidney beans soak up the soy sauce and vinegar broth. I think it pairs nicely with the chicken that has been simmering for about an hour on the stove. My favorite part of this dish is spooning the thin, savory broth over white rice. Yum! My comfort food comes in all shapes, flavors and complexities. 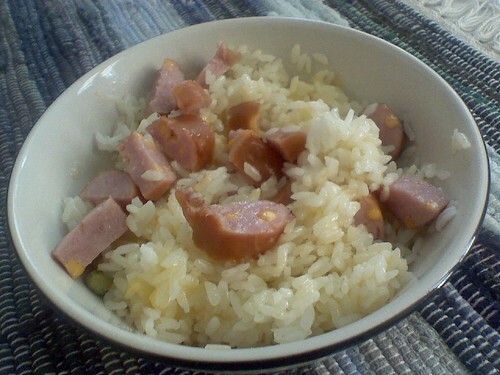 Oddly enough, memories of my lola has me heating up a bowl of white rice and smoked cheddar sausage in the microwave. I also add pads of margarine over the rice. I know – weird right? Good thing I’m not pregnant! 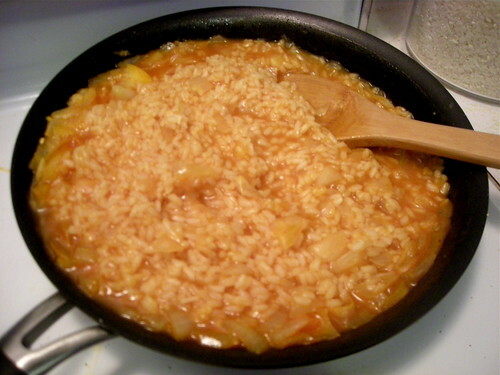 The flavors of tomato sauce, spices and chopped onions held up quite nicely with white rice. Inside the newsroom on Cinco de Mayo, my co-worker shared his wife’s rice as part of a Mexican breakfast potluck. I loved it and I begged him for the Cardenas family recipe. A few days later, he got it from his mother-in-law and shared it with me. 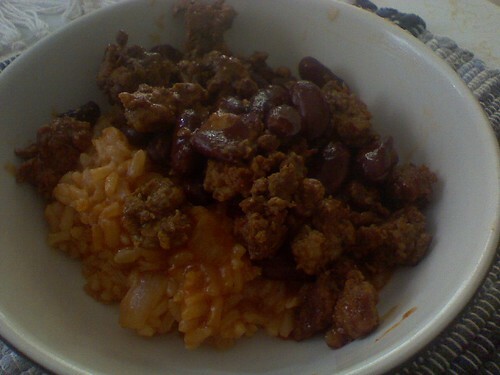 After simmering for 20 minutes, I served the Cardenas rice with spicy chorizo and kidney beans. I think my hubby enjoyed the spicy, savory dinner. It might as well be Summer. This weekend, I welcomed the first days of 100-degree whether with Jim Bean poured over ice. I love making mint juleps with fresh mint leaves from my garden. In fact, I’m quite delighted with how my mint and spearmint plants are still thriving after I planted them last year. I’ve crafted my mint juleps based on how they were made by my DC buddy, Stephanie. Almost a decade ago, she helped me serve mint juleps at our house warming party in the Richmond Hills. Some people thought her icy drinks tasted strong. 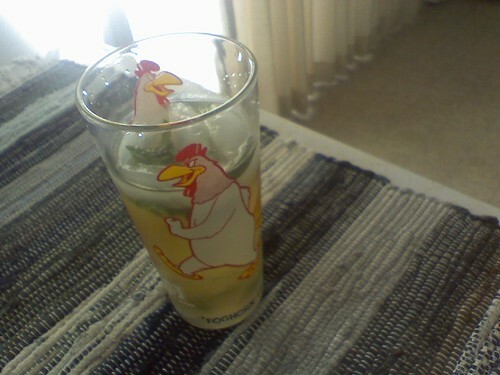 I place the mint leaves at the bottom of the glass. After adding sugar, ice cubes and soda water, I muddled it up with a spoon. I pour Jim Bean on top. After taking a sample sip, I adjust for sweetness and Jim Bean-goodness. I enjoy my mint julep out on the patio and I like my Southern-inspired cocktail to be sweet with a heavy pour of the whiskey.